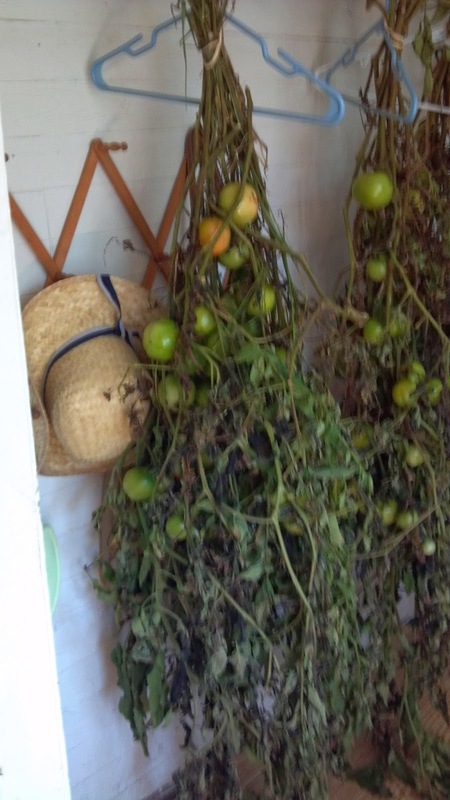 pull the tomato plants up by their roots and hang them upside down in the barn. 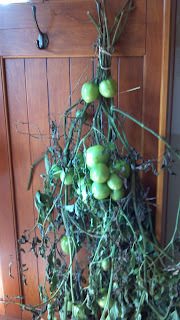 The tomatoes finished ripening as if they were on the vine, which they were. 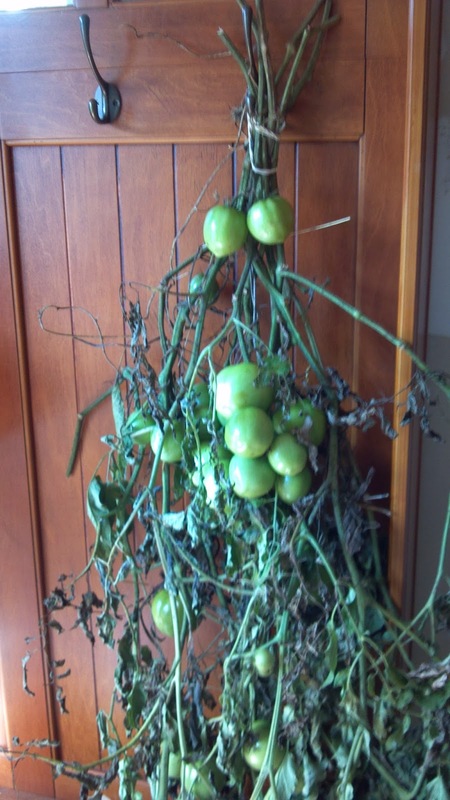 This is similar to the tomato clusters that grocery stores carry now where the fruit is still attached to the stem and costs a lot more because it is supposed to have the vine-ripened flavor from those five tomatoes being attached to that 3-inch stem. My tomatoes have such an advantage! I focused on clusters of tomatoes and traced their stem back at least an arm's length. 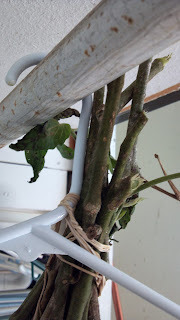 Several vines were bundled together and rubber-banded to a hanger and hung in the coat closet. They are crazy heavy but if they don't break the rubber bands or the hanger, they should get lighter as the plants dry out. Tomatoes in Georgia are way too long to pull up by the roots and hang anywhere. I felt pretty lucky to find an arm's length of vine and that was hard. They made a really nice picture. So if it doesn't work the second time, at least I got a great picture and a blog post out of it. Very cool. Anything to extend tomato season is worth the effort. 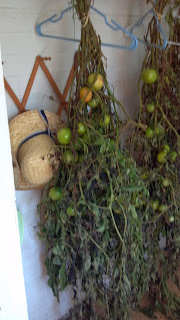 We take all out green tomatoes off the vines (before the first frost hits) and put them in a shallow cardboard box in the pantry. In a few weeks they ripen and while they're not the most flavorful, we use them for one last batch of pizza sauce. These were a little more juicy than the green-turned-red, but a lot more trouble!